Just sharing a picture. Danshui sunset, taken on the iPhone, as-is with no editing. The northern town of 淡水 Danshui or Tam Shui was not originally in my itinerary. I had seen some mediocre reviews and photos of the place, and thought I'd give it a miss. But as luck would have it, a friend of our travel buddy brought us there, and we ended up enjoying the coastal charm and old street delights. Jay Chou has a song "Tam Shui Seaside". He also studied at Tam Kang Senior High School there and later used it as a venue for his movie Secret. Beautiful song. Meanwhile, eight intensive days in Taiwan so soon after Okinawa has left me exhausted! I will continue with Okinawa posts (about 7 more to go) but I'll share some local posts in the meantime as well, including a most memorable dinner with one of the best chefs to have emerged from Taiwan - Andre Chiang. That's an absolutely gorgeous place in Taiwan to visit, it's one of my dream destinations to visit before I die. Did you manage to take a walk through the nearby mangrove conservation area? It's something like our Sungei Buloh in Singapore. Oh I didn't know about the mangrove conservation area. But it was already evening when we reached Danshui, so we didn't have much time. Still lots of places there I didn't see. 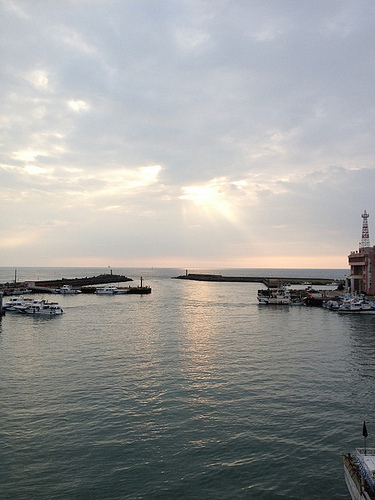 But if I do go back to Taiwan, I'd be sure to schedule more time in Danshui. We also bought a lot of things there! Great place. Never missed going there every time I go to Taipei. Fantastic street food. I especially love the deep fried Sotong. Light batter and super tender and large tentacles. Not forgetting the oven roasted pork belly bun....super fragrant and sinful. Catherine! you brought back memories of the time I was on an exchange programme in Tamkang University, long.., long... ago. Our hosts brought us to some backstreet down the hill for my first experience with that fermented tofu. Thanks for the fond memories (of my youth and the people I met ;D). Wish you a happy Easter too. I haven't been back to Dan Shui since 2005 as I've been a couple times in the past. Certain areas seem a little on the touristy side (nowhere near as bad as Shihlin Night Market, or Venice Italy for that matter), but if you navigate certain ways you can still get a worthwhile local experience you can personalize. The shark meat fishballs with minced pork inside (Fuzhou style fishball soup) are a local specialty, and of course "Ah Gei" (which is somewhat of a derivation of the Japanese word age/ah gei, like agedashi tofu), as well as simmered soy sauce (and herbs) quail and chicken eggs (tieh daan/iron eggs). One possibly fun thing to do is to walk over the bridge to Ba Li, perhaps rent a bicycle and soak in the scenery. There may be some hot spring indoor spa type relaxation places too. Anyways hope you are having a great time there. Hi BNG! You're the Taiwan expert, man! Those are great suggestions. I agree certain areas are pretty touristy, but it's easy to ignore those and focus on the local details. I did try the "Ah Ge" and iron eggs. Pity not enough time to bike around leisurely! Peech is the expert, he lives in Taipei! 五月天 (Mayday)- 志明與春. They sing in the Fujianese dialect (Taiwanese), and Danshui has a brief mention at the 51st second mark.